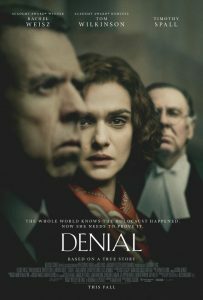 Check out Rachel Weitz’s new movie, Denial, where she poses as writer and historian Deborah E. Lipstadt. She battles for historical truth to prove the Holocaust actually occurred when David Irving (played by Timothy Spall), a renowned denier, sues her for libel. I saw a woman who trusted no one, learn to trust. I saw her struggle to give up her independence and overcome an individualistic approach for a larger team-based win. Tom Wilkinson’s character demonstrates the most humane mentor and advocate. I think we need to better understand how deceivers and liars can use the court to silence truth tellers and crush bigger truths. The scenes at Auschwitz evoke a great horror of what happens when we let ill people rule. Let us not forget.